Ever wondered how your burger got from cow to cardboard container? 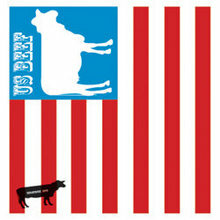 It’s certainly not the first time the ethically dubious practices of fast food corporations have been on the agenda, but Missing String Theatre Company manages to broach such issues with fresh laughter in this satirical take on America’s fiercely consumerist obsession with cheap meat. Central character Buck, our narrator of sorts, starts at the bottom of the fat-oiled corporate ladder as a door to door meat salesman for the oddly unsavoury sounding Meatbox, a corporate monster promising a pseudo-democratic vision of meat for the masses. Through his personal story of grubby corporate climbing, Missing String deploys its satirical barbs using a wacky blend of comedy, drama and country music. From soulless marketing speak to the hypocrisy of the supposedly ethical consumer, little emerges unscathed. This is also a satire in which the consumer, and therefore the audience, is deeply implicated. As one fast food outlet employee accusatorily tells us, we are “the cog that turns this machine,” the demand that drives the increasingly unethical supply. This dirty complicity, however, is not taken as far as it could be. By making only half-hearted attempts at addressing spectators, Missing String neglects an opportunity to make the audience squirm and, as a result of that discomfort, think. It might make you pause before tearing off that next chunk of meat, but this is unlikely to create many vegetarians.